3D printing technology is emerging and one of the barriers that prevents many designers and engineers from 3D printing their models is the availability of 3D printers or service availability. Although many cheap 3D printers are introduced through websites like Kickstarter, it is still expensive technology especially for designers who use it due to narrow project implementations. If the designer has frequent 3D printing projects, these revenues can help in covering the costs of the 3D printer and the 3D printing materials.. Many websites help designers to overcome this problem by offering 3D printing services online such as Shapeways, i.materialise, Sculpteo and Pinshape. Through these services, the user can upload the STL file and go through a simple process to choose the 3D printing material and review the final model and price before 3D printing. Once the model is printed, the company ships the 3D printed product back to the designer. Online 3D printing services extends the chances of printing with different 3D printing materials such as plastic, ceramic metal and more. This advantage is not available in cheap 3D printers which depend on the Fused Deposition Modeling using plastic filaments. One of the major disadvantages of using 3D printing services is the price of the final model. The 3D printing price can be very expensive, which makes product development using this technology impossible especially on the commercial level. PrintThis4Me tried to address this problem and solve it using a bidding system is also known for many remote-hiring websites and platforms. PrintThis4Me provides a community of buyers and sellers. The buyers are the users who would like to have their 3D models printed using the rapid prototyping technology. The sellers are the designers who have 3D printers available and are ambitious to provide their 3D printing service. 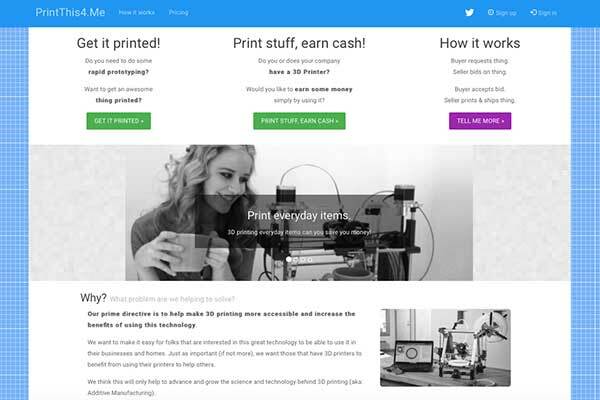 The buyers post a 3D printing request with all the requirements through the community. Then, the sellers start to bid by providing a lower price to get the deal started. Once a specific seller wins the bid, the job goes to him or her so it can be 3D printed and shipped back to the buyer. The platform works on a similar matter to many other sites such as Odesk and eLance, the only thing is PrintThis4Me is specialized in 3D printing services. The community has a rating system, so you can rate the quality of the 3D printed models and if it needs the requirements. This provides another advantage because you can get the model printed on a lower price with a high quality of 3D printing at the same time. The payment system in the PrintThis4Me is secured through the escrow system and the company charges 7.5% fee for each transaction. For example if the 3D printing service will cost $10, the company take $0.75 as a fee. Although the percentage is high, yet once other competitors enter the market, this percentage can be lowed. As mentioned earlier, many designers believe that the 3D printer will not provide the return of investment (ROI) required to buy a 3D printer even if it is a cheap one. Using PrintThis4Me can help many designers to see the 3D printing service as an investment method to get paid using this emerging technology. While the website still faces early development issues and the platform is being updated, this project can take the 3D printing industry to a new trend by enabling everyone to get affordable 3D printing service while being able to compare between wide variety of prices and qualities, which were not available in the previous services.